Did you guys know that “National Adopt A Pet Day” is on April 30th? Well, it is! If you’re thinking about adding a furry addition to your life; today I’m giving you 5 reasons why that addition should be a shelter pet. I hope you guys enjoy the post and have a marvelous weekend! My family has always rescued animals. Many years ago, we lived on a ton of acreage, and built kennels for stray dogs that needed a home at the time. After we moved away, we just had 1-3 dogs at a time. But, about 6 years ago our last dog passed away and we’ve missed having a four-legged pal in our home. 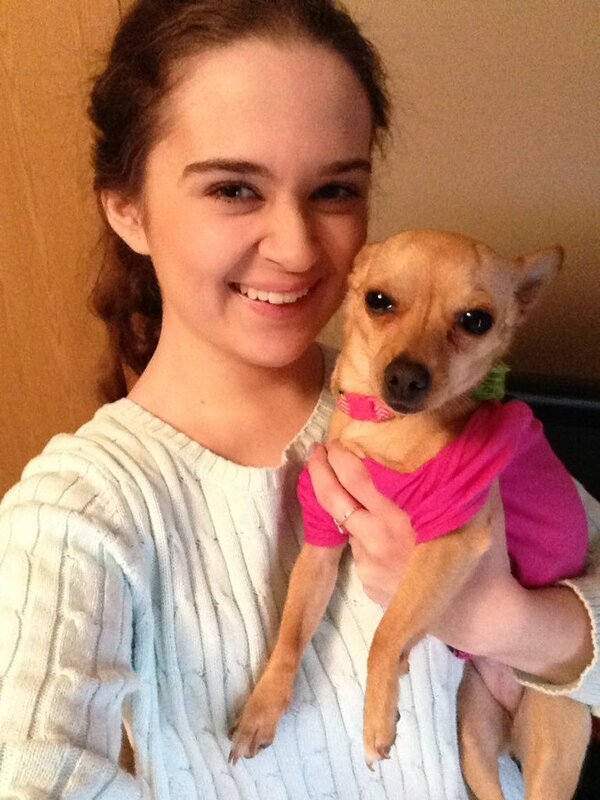 Less than six months ago, my family adopted a little 6-pound chihuahua from our local animal control. We’d been looking for a dog for a few years and just hadn’t found one that was the proper fit. Every few days or so I’d go onto Petfinder.com and see what new furry friends popped up within a 30-mile radius of me. One day I saw a little furball named “Piper,” showed her to my family, and within 72 hours we were bringing her home. Today I’m going to share my top 5 reasons you should adopt a shelter pet. 1.) A cage is no place for a life – – I don’t care if the animal has been in the shelter for a day or 3 years, no enjoys being in a cage. Animals have feelings; they experience mental and physical distress just like us. So, if you wouldn’t like being in a cage for 20+ hours a day, why would they? By adopting a shelter pet you’re literally breaking the lock on their cage and giving them a second chance at living life. 2.) Friendship — Animals really are a human’s best friend. They make the best listeners, cuddle buddies, and overall, great companions. If you’re more of an introvert or aren’t the best at conversation, consider getting a pet. A lot of people have noticed they’re more sociable when they have a pet in their life. 3.) It’s rewarding — This is something some we all love to feel; rewarded. It’s nice to do good things and we get this “natural high” from doing such. I’m not recommending that you get a pet for an ego boost. But, if you adopted a pet and have given them a second chance, you should be very proud of yourself. You’ve, in a lot of aspects, saved a life! 4.) Lessons to be learned — Not only are animals loving, but I feel like they teach us how to love. Whether you consider yourself a loving person or not, I bet an animal can teach you a new way to love. Animals are so forgiving. If we raise our voice or get exasperated, they’re still there and they still love us. Animals don’t hold grudges and they don’t know anger. They may be damaged from their past life experiences, but we’ve all been through something that has left us scarred; that doesn’t mean we don’t deserve somebody to love and somebody to love us. 5.) Got fun? — Let’s get light for a sec. Pets are a lot of work, but they can be just as much (if not more) fun! Everything from the way they always want their belly’s rubbed or how they wag their tails at a rapid rate when we get home from work. They bring joy into our lives. They make us not take this big ol’ world so seriously. They enrich our lives. The work we put in is nothing compared to the love we get out. If you’re thinking of adding a new furry friend to your life, I hope these reasons gave you a little bit of perspective on why you should adopt a shelter pet. I’m not saying that all breeders are bad or that you’re a bad person for getting a pet from one. I know so many people who have done just that and they have given their pets wonderful, happy lives. I’m just saying that there’s so many lost souls out there who have faced rejection, loss, and despair. Just be sure not to count them out! I’m sure any dog would be lucky to have you as an owner. I’m thinking of branching out and writing more posts about pets, pet care, adoption, pet tips & tricks, and much more! Are there any specific animal-related topics you’d like me to discuss? Do you have any pets? What are they? What’s their name(s)? Pets are the best! We have two cats and a bird – Smokey, Leah, and Alan the green cheeked conure. Animals really help people heal. We used to have chickens and ducks when we lived on a bigger property. Now we just have multiple fish tanks. I preferred having chickens though as they were a lot less work and we got fresh eggs all the time. Edye, I love this post. I am an animal lover of note. I wish we had a massive farm to be able to take care of all the strays out there. All our pets are rescues. We have three dogs (all girls) Saxon, Briley( and Skyler and three cats (two boys and one girl) Hunter, Dexter and Puffin. We did have another boy cat named Taylor, sadly he passed away with cancer 6 months ago. As always, thank you so much for your kind words, Lynne! Pets are such a blessing and they add so much to our lives. I love your fur babies’ names and am sorry to hear about Taylor. Wishing you, your family, and all your furry friends a wonderful Easter. Can’t agree with you more Edye. I can’t understand when people spend money to BUY a pet instead of adopting one. And don’t get me started on how wrong I think it is to sell-buy an animal, like it’s a property! Thanks for sharing this great post! I miss our two Beautiful boys. They both passed a few years ago. We have considered a rescue dog. Waiting for the kids to be a little older. Great post. I just found your blog because of this post. When the time comes for us to get a pet again we will most certainly get a rescue dog and/or cat. They make our houses a home don’t they. We’ve been without a pet for over 4 years now. And I don’t think a day has gone by that I haven’t wanted one. Right now we have to wait but when the time comes it will be a rescue. We may decide to foster for a while before we rescue. Hi, Lea! I’m so glad you found my blog! I know what it’s like to go without a pet for years and years, but once you get one back in your life, it’s like they’ve always been there. I’ve heard so many success stories about foster parents for animals. You’re giving the pet a chance to know a life outside a cage and seeing if they blend well with your family. A win for both paw-ties!